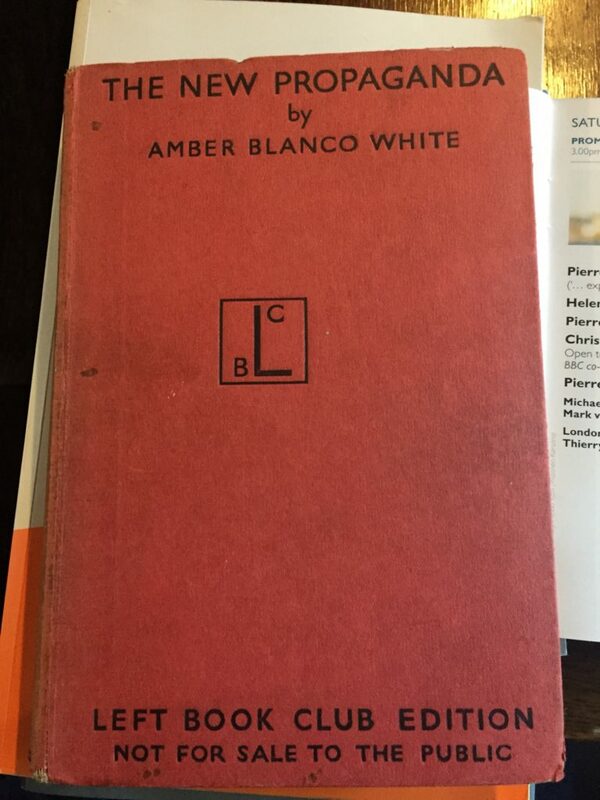 In her book The New Propaganda, written in 1937/8, the British feminist and scholar Amber Wells Blanco White (read about her here… ) dissects the use of modern communications technologies to support the Fascist regimes that then existed in Europe and attempts a psychoanalytic explanation of how mass media can lead populations to support autocratic leaders like Hitler and Mussolini. It’s a fascinating and frightening book, and was clearly used by Orwell as he designed the architectures of control used by the Party in Nineteen Eighty-Four. “To sum up the argument of the last two chapters – the dictator who wishes to keep in his own hands all the active initiatory functions of government, and who presents himself to his people as representing the whole wisdom and power of the state, will find himself under compulsion to behave in a certain manner. This general necessity is not, of course, the only force which affects him at an particular time, nor does it operate in vacuo. Each individual decision he makes will be the resultant of many factors. Some of these will be political and economic, some will depend on his intelligence and experience of life, others upon the personalities of those who surround him and the advice they give. There will also be an element which can only be called sheer luck. But beside these, arising from the situation in which he has placed himself, will be the necessities of which we have been speaking – the compulsion to lie, to stamp out freedom of thought and expression, to create a racial or nationalist myth of a self-adulatory type. Whether he (or his press or his officials) restrict themselves to the truth on any given occasion will depend on upon the state of their environment at that particular moment. If they prevaricate, the particular lie they choose will depend partly on the circumstances of the moment and partly upon the nature of any preceding lies they may have told. But their need to repress and control opinion will be continuous. Any contemporary resonance is, of course, in the mind of the reader.